Modern detached villa that sleeps 6 easily with stunning views of Souda Bay with a spectacular mountain backdrop - the best of both worlds. Located in the heart of the Kokkino Chorio (named Red Village on account of the fertile soil) and made famous by the film Zorba the Greek, this location offers a great mix of peace, quiet but no so remote that you need to drive for a meal or drink. The local Tavernas and minimarket is only a stroll away. Local villages of Plaka and Drapanos are nearby offering an assortment of tavernas and mini-markets and some local farmers selling their produce of honey, wine, raki fruits and vegetables as well as olive oil of course! The superb beach resort of Almyrida with it's excellent restaurants, low key nightlife, and for the more adventurous, non motorised water sports is less than 7 mins away by car. Kalives a further 5 mins round the bay is another traditional resort, again with an excellent range of restaurants and shops. Both resorts offer Blue Flag accredited beaches and shallow waters perfect for young children. This outstanding Villa is in the heart of a traditional village with taverna and shop nearby and fantastc beaches minutes away. This unique position offers the best of tranqulity with vistas to the sea and mountain yet only minutes from beaches, water sports and more tavernas and shops. The beautifully tiled bathroom has shower, toilet, modern vanity unit with mirror and shaving point. Complimentary bathroom products will be supplied together with fresh cotton towels and slippers. Fresh linens provided for each week of your stay. Fresh cotton towels (face, hand and bath size) as well as beach towels for each member of your party is provided for each week of your stay. Spacious lounge area has a large corner sofa (converts to double bed with metal action and mattress). Bean bags, chair with foot stool for relaxing. Large enough to accomodate all the local produce you can manage including beers and wine! We have supplied all the kitchen dishes and utensils we think you will need as well as complimentary range of teas and coffee to get you going. Fully fitted kitchen with oven, hob, integrated fridge/freezer, microwave, toaster and electric kettle. Indoor and outdoor dining for up to 6 people. Sat TV available (channels vary). CD Player provided (bring your own CDs). Books, books and more books provided by ourselves and previous guests. Magazines provided. Board games for small and big kids as well as a serious chess board provided. Wide range of DVD movies to choose from kids, teens and grown ups favourates. Private garden has a good mix of grassed and terraced area for your sunbeds. The balcony off the living area on the second floor is the best location to watch the sun go down over the bay with a glass of local wine. Overlooking the olive grove and to the sea, the second floor terrace offers fantastic views of the village square and the bay of Souda. It's covered to protect you from the sun as you dine alfresco! There is a patio area (covered) that leads to the private garden and pool. Great for chilling out and also has great views to the bay. The shared pool is a great size to cool down or enjoy a good swim. The pool is on a small private plot with 4 other Villas (that are not always occupied). 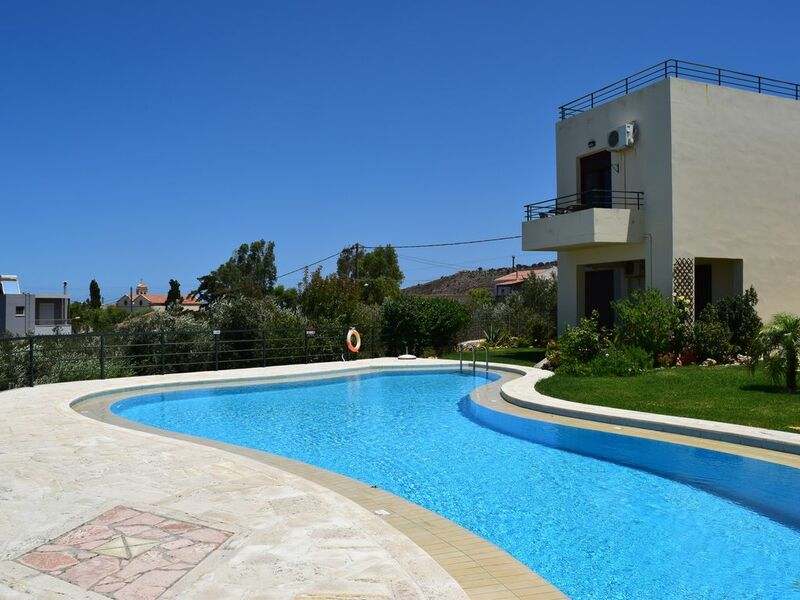 Notes on accommodation: EOT Greek Tourist Licence obtained for this villa and pool, reference MHTE: 1042K123K2726201. This gives you peace of mind that the villa and pool complies with strict standards of health, safety and comfort for our guests. Each bedroom has large patio doors leading to the private garden, shared large pool and offer suberb views of Souda Bay. Your villa is fully equipped with all amenities including AC in every room and internet access as standard. There are two traditional tavernas offering organic fresh home made food and local wines only a stroll away. Really nice villa in quiet location. Very well equipped villa and the most stunning views. Hire car definately an advantage, 10min to nearest beach at Almyridia. You can walk but it's all downhill so uphill on return. Spotless villa and pool, perfect place to relax, local tavernas ok to eat at and local shops have necessary supplies. Would we return-YES. Beautiful villa in a charming location! We have just returned from a fabulous two weeks at the villa. The views are stunning over Souda Bay and the sunsets are incredible. The villa is spacious and the pool is perfect with a shallow and deep end. The children loved it, as did we. Kokkino Chorio itself is small yet charming. There’s a real sense of community there. The local taverna is great with a good selection of meals. The local shop is great, although as so many English brands are imported it isn’t cheap. We managed without a car and walked down to the beach at Almyrida (45 mins) as well as to Plaka (20 mins) for evening meals. We got taxis back as it was too steep to walk back. The villa is well equipped with pretty much all that you need. We made great use of both balconies and all of the people in the neighbouring villas were very friendly. Despite all of the other villas being occupied we were still often the only ones in the pool. We did have some bother with the pesky wasps who descend en mass if you eat dinner before sunset. We didn’t get bothered by them at lunch or in Almyrida, but in the village they were a problem. The solution was to order food as the sun was setting and then we had no further problems. I would thoroughly recommend this villa and we certainly plan to return at some point in the future. Well designed and situated at the quieter end of the plot. Two great balconies. Thanks so much for letting us rent your villa. We thoroughly enjoyed our stay and the rest and relaxation. Unfortunately the weather wasn't as good as usual for this time of year. Nevertheless we enjoyed visiting many places around the western end of the island. The villa is very well equipped and comfortable with amazing views across Souda Bay. My only criticism is that we did not receive a mid stay change of bed linen and towels. Hello Lynne, we are delighted you had a great time at Villa Victoria and enjoyed the area, it really does have everything for a superb holiday. Note: fresh linens and towels were available in the cupboard to change at your convenience. We find guests prefer that. Property was perfect for our needs. Lovely location in pretty village with amazing views. Everything you need for your stay and very nicely furnished. Lovely villa in a beautiful location! We stayed at Villa Victoria with three of our children for two weeks and it was wonderful! The villa was lovely, very well equipped and perfectly situated in Kokkino Chorio. We are now on a mission to save up for another stay at this perfect holiday location! Unlike the high remote areas of Kokkino Chorio, Villa Victoria enjoys fantastic position situated near to the main square in Kokkino Chorio (translates as Red Village on account of the rich soil). This position offers tremendous views of Souda bay and strikes the right balance between peace and quiet yet a short stroll to the local traditional tavernas in the main village square (with live music on offer from time to time) and also at the local glass art works with a lovely Taverna there too. There is a well-stocked minimarket for all your food, drink and other essentials (bread, eggs, fruit and veg delivered fresh) just a stroll away. The villa is near to other villages such as Almyrida, Plaka, Drapanos, Kambia and Gavalahori (get sampling the local olive oil and raki!) . Is there internet access at the villa? yes! TV? sat tv is available. The pool is big! It is a great size for a good swim. It is shared with 4 other villa’s in the same plot when they are occupied. There are sun loungers in your private garden and fresh beach towels provided in the villa so you don’t have to worry about bringing them with you. There is a private car park adjacent to the Villa. The road leading to the villa has recently been resurfaced so no dirt tracks! Blue Flag beach resorts of Almyrida and Kalyves are within 7 to 15 mins by car. These locations offer a wider range of tavernas, coffee stops and shops, bars & water sports as well as banks, pharmacy and gift shops. Airports: Chania - 35 mins by car, Heraklion 90 mins by car. It’s easy to drive around Crete, it has one national road (main road) with good signage in English and Greek. Loads of airlines operate in both airports: Easyjet, Jet 2, Ryanair, Monarch, Thomsons, Thomas Cook, Aegean, Olympic Airlines, Norwegian Air and many more and most now from most UK airports, Norway, Denmark, Sweden and most other European cities. Good connection routes from EU airports and from Athens will take you into Chania or Heraklion. Surf Skyscanner.net or Travelsupermarket to compare routes and prices. Although we don't offer pick up service, car hire is recommended with both airports and local company’s car companies offer excellent rates. We find ‘Art Car Rental’ particularly competitive and reliable. There is a good taxi service available from outside the terminal building of both Chania and Heraklion airports and bus services that will take you into the main towns and from there taxi service will take you to the Villa in Kokkino Chorio. For those interested in longer term lets, perhaps over winter in preparation for permanent move or those seeking an activity holiday for walking or cycling you will find the area and Villa Victoria in particular is a great place to be based. We can offer competitive off season rates, please email with the dates of your intended stay. Western Crete is an ideal spot for walking and cycling and many groups use the location for exploring the authentic country side. There are many point of interest including gorges, coves, caves, historical buildings and museums that illustrate the history of this part of the Mediterranean and cyclist love the challenge of the varied terrain. Many come to have guided or unguided walks during the cooler months in the countryside or exploring the gorges and caves. If the dates you are looking for are not available, consider a two centre holiday and book a second villa or apartment. This offers good opportunity to explore the island. The villa has air-con via remote control and alternate overhead fans in every room and all doors and windows are framed with sliding insect nets. The villa comes fully equipped including Sat TV, DVDs, fridge freezer and washing machine plus all the usual stuff in the kitchen. Free Internet is available all year round. Travel Insurance: As with all travel please take out your own holiday insurance to meet your needs prior to arrival. The rental of the villa and use of the pool does not include any insurance. Owners use the villa and pool at their own risk. Offseason rates exclude cost for utilities, internet, pool and garden tidy estimated at £95 per month. Cost of villa clean x 2 will be charged for long term lets. Please inquire for quote. Changeover Day: Flexible on dates. However, Villa Victoria must be vacated by 12 noon local time on date of departure. Arrivals accommodated from 16.00 local time. Notes on prices: Price per week for Villa hire for party of up to 6 and includes full Villa clean prior to arrival, fresh linens, towels, beach towels, complementary bathroom products, slippers, starter tea and coffee!!. Villa now has free Sat TV and unlimited free internet. Thank you to all our guests who enjoyed Villa Victoria, looked after it and provided fantastic feedback.